As promised here are some pictures from North Country Studio Workshops (NCSW) These pictures are from Patrick Dougherty's class and since it was right below Bob's class I spent alot of time looking out of the windows down to the class. They made giant sculptures out of branches. You may want to check out his web page Patrick Dougherty! Wow. 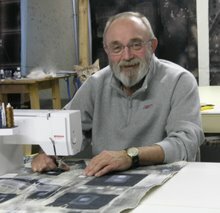 Well we are back from Vermont where Bob taught a stitch class at North Country Studio Workshops. It was an amazing experience. I will post pictures soon. Since I recently lost my job (about one month ago) I find that I will have plenty of time to tend to the blog. So here we go. Have you ever been to a Chiropractor? I have not since my brother, whom I loved dearly, was an MD and really didn't think much of them. Well Bob has had a pain in his neck (not me...really!) for years. Old football injury and he mentioned it to our MD and he took xrays and said Bob had arthritis in his neck. Well duh! End of discussion. So for Valentines day I gave him 4 sessions of acupuncture at The Spine Worx which is near our house to help with the pain. Well Dr. Jim Pucka said sure he was licensed to do acupuncture but why not fix the problem not just the pain. So that is what is going to happen. I certainly will keep you posted. Bob has a student coming here to the studio from Kentucky next week for a 3 day class. That should be fun. Well that is all for now. I will post pictures in the next few days of Vermont.